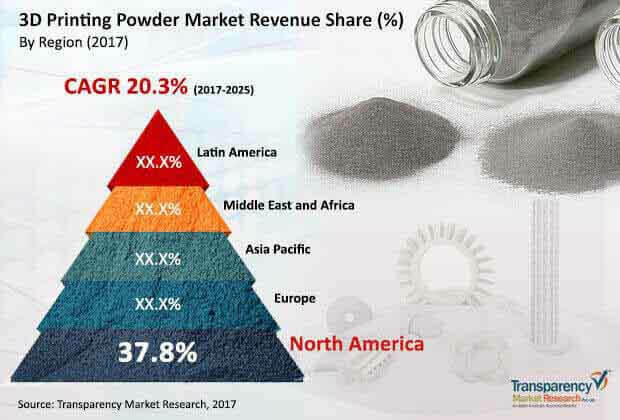 The vendor landscape in the global 3D printing powder market is dotted with a plethora of manufacturers and producers offering or supplying powders primarily for a variety of industrial applications. This is what accounts for a fair degree of competition prevailing in the market, notes Transparency Market Research (TMR). TMR observes that over the years, a constantly expanding application of 3D printing technologies will attract new entrants, including local players seeking to firm their foothold. This will also increasingly contribute to the lucrativeness of the global market. Top players operating in the market include LPW Technology Ltd., Sandvik AB, Arkema, Carpenter Technology Corporation, Advanced Powders and Coatings Inc., Hoganas AB, GKN plc, Metalysis, and Arcam AB. Several prominent players are focusing on making strategic investments and consolidating their geographic reach, in order to consolidate their positions and get a better hold over the market, regionally as well as globally. The opportunities in the global 3D printing powder market is projected to surge from US$313.7 million in 2016 to reach an approximate worth of US$1,558.9 million by 2025 end. This represents the market proliferating at a spectacular CAGR of 20.3% from 2017 to 2025. The various industries where 3D printing can be applied can be grouped under aerospace and defense, medical, automotive, and architecture. Of these, the aerospace and defense industry is a prominent segment with widespread uptake of powder-based 3D printing. This is attributed to the extensive application of powders in for 3D manufacturing of engine parts, airbuses, and missiles. On the regional front, North America accounted for the dominant revenue share in 2016 and is expected to display a noticeable potential for growth. However, Asia Pacific is emerging as a promising region for market players over the forecast period. The rising revenue share is fueled by substantial investments being made in the technology. The rising demand for advanced additive manufacturing technologies for 3D printing complex designs is a key factor propelling the demand for 3D printing powder. The market is driven by substantially growing usage of powder-based 3D printing in a wide spectrum of industries such as healthcare, medicine, defense, energy, consumer goods, electronics, aerospace, and automotive. The rapid pace of manufacturing taking place in several industrialized nations is supporting the market growth. The search for higher quality finish and advanced mechanical properties of the printed material that can be used to meet demanding industrial needs is a notable factor fostering the demand for 3D printing powders. In this regard, the promising application of 3D printing for producing automotive components and tools with unique mechanical properties is accentuating the demand for 3D printing powders. Furthermore, 3D printing powders are gaining traction among automotive manufacturers for tooling and prototyping jobs. In recent years, relentless research and vast development activities have been undertaken in various parts of the globe to develop high-grade metal powder which can be used for 3D laser printing. Thus bodes well for the market. In addition, advancements in powder production technology and several industry efforts to make metal 3D printers more affordable are factors catalyzing the rapid expansion of the market through 2025. The growing usage of powder-based 3D printing processes for producing medical implants is creating new, exciting avenues in the market. The decrease in prices of desktop metal printers in various parts of the world is a favorable trend boosting the uptake of 3D printing powders. The study presented here is based on a report by Transparency Market Research (TMR) titled “3D Printing Powder Market (Product - Plastics, Metal (Stainless Steel, Cobalt, and Nickel), and Ceramic; Application - Automotive, Aerospace, and Medical) - Global Industry, Size, Share, Growth, Trends, and Forecast 2017–2025”.